Wednesday, Mar. 9, 2016, 12:30 – 1:30 p.m.
How do you find and get the most out of your community service? This workshop explores how to contact and maintain a great relationship with community partners that can lead to you to job opportunities, recommendations and most importantly meaningful service! 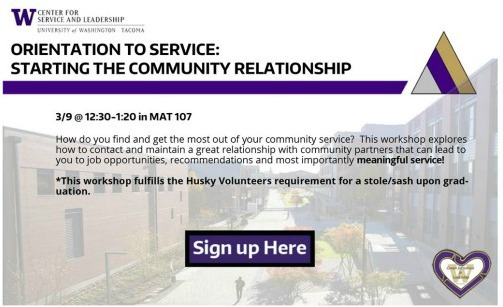 *This workshop fulfills the Husky Volunteers requirement for a stole/sash upon graduation.